Khartoum - a city of three cities; Omdurman, the capital of the Mahdi and home to nearly 3 million; Khartoum Central (over 1 million residents) where our hotel is and Khartoum North (almost a million). Our area is a network of alleys and laneways between wide, busy streets. There's a lot of dust, and our main landmark is a large digital clock / date / temperature reader - which is why we know it's nearly always over 40 degrees at 3pm, and seldom under 34 anytime of the day or night. We seem to have ended up living in the shoe souk, though the entire neighbourhood is known as Souq-el-Arabe, which is handy as a minibus call. After the grim registration process, we were anxious about the dramas that might await purchasing train and ferry tickets. 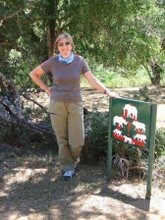 The first bit of fun was finding a bus going that way, and in the end we succumbed to the relative ease of taking a taxi. They are really expensive here, but Mohammed our driver advised us not to use the yellow Toyotas like his, but the mini vans instead as they used diesel. What a guy. The railway station was huge and empty...because they don't sell train tickets, we discovered! Yasser Yassim, the trusty booking clerk, enjoyed chatting to us but wouldn't sell us a ticket till Saturday because "we don't know when the train will arrive". I guess it makes some weird kind of sense. But we could and did buy the ferry ticket (this is the ferry from Wadi Halfa at the base of Lake Nasser, and the way we'll enter Egypt). Luckily the ferry office had big pictures of boats all over the place, making it easy to find. We have also made a visit to the National Museum, which was fantastic. 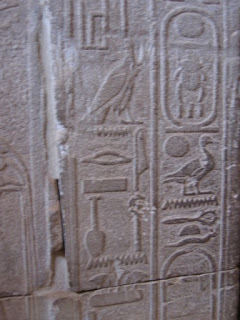 The Nubian, Kushite and Meroitic civilisations, are all represented and three temples removed from the flood area of Lake Nasser have been reconstructed and are in the museum garden. I am still trying to get my head around all the history, but it seems that for a time anyway Egypt was ruled by a dynasty from Nubia (ie Sudan) - not sure if this is how it will be reported in Egypt though. 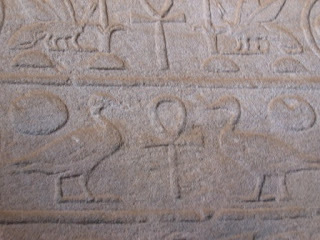 Some heiroglyphics from the temples reconstructed in the garden of the Sudanese National Museum, Khartoum. 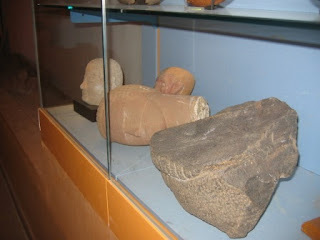 I love the way exhibits have fallen in the glass case; the statue on the right is known as the Nubian Venus. 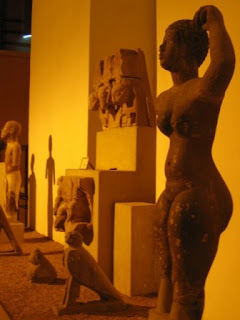 A Nubian king (Thanakal) is represented as a larger than life stone carved statue. The schoolgirls who practised English with us - love those uniforms! Boys wear identical fabric, but their background colour is teal green instead of blue. 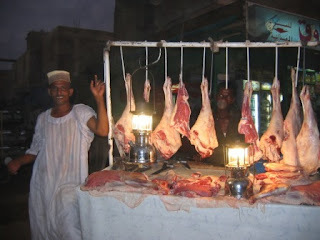 Markets are a big part of Sudanese life, and we visited the souq at Omdurman, though it was late in the day and many of the stores were closing up. This meant though that everyone was pretty relaxed, and it was good to see the night market in all its glory. 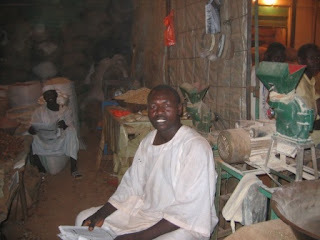 Lots of spices, the air was thick with them, butchers (in gory glory), tea sellers - all very exotic and colourful. 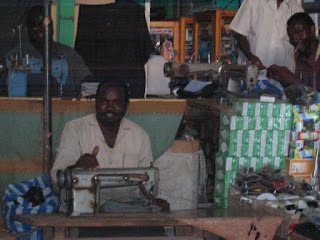 A few pics from the Omdurman souq: tailor, butcher, miller and tea lady. 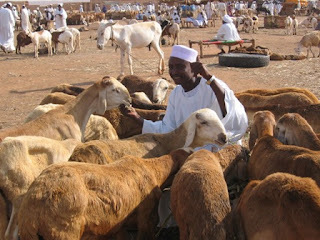 The other thing that's dear to a Sudanese heart is his livestock, and so we travelled out to the daily market. We'd hoped to see camels, but there weren't really that many there, the main business was in sheep and goats, with a few cows thrown in. 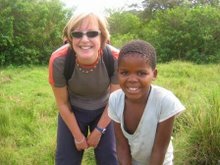 The trip out was complicated - there were six of us to begin with, so we charted a mini van, which quite far into the journey stopped because it was running out of petrol. "We'll pay the fare and you can buy some more," we said. 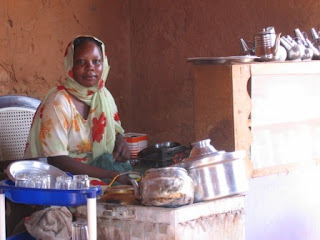 No good - the petrol was back in Omdurman. That was that. 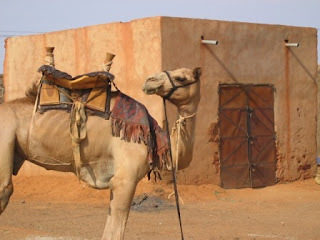 Bruno saw a donkey cart, and negotiated with the driver. Soon we were all on the carpet-lined wooden cart, jogging along for the last 3km or so. 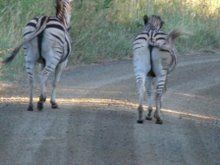 There were groups of white robed men, gathering protectively round their small herds of animals, keen as anything to get their photos taken. Deals were going down, and the amounts of money seemed quite large. The area outside the yards was full of Toyota 4WDs, just like at home I'd say, except these ones were all pretty ancient. There were also a few huge old workhorse trucks that had obviously brought stock in from the countryside. 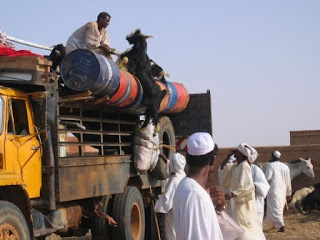 A pretty camel, the goat delivery system at the Omdurman livestock markets, and a proud sheep owner.